The best, cheapest, and easiest way to fertilize a tree is to mulch it properly. Mixing leaves into the mulch each fall adds a lot of nutrients. If your trees are healthy, use the leaves from your lawn that have been chopped into small pieces with the mower. 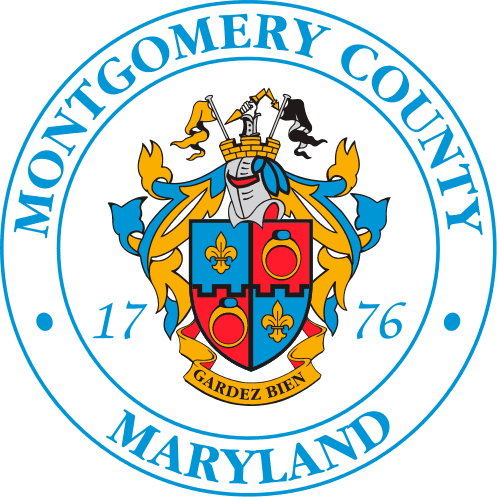 If the leaves appear to be unhealthy or moldy, then don’t mix them in your mulch. I think my tree needs a fertilizer. What should I do? There are times when fertilizers are needed. The best way to figure out what kind of fertilizer your tree needs is to test your soil. The results will also tell you how often and when to apply the fertilizer. 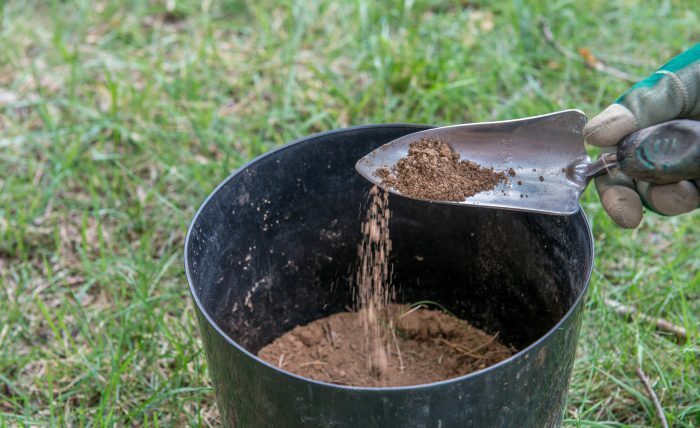 An additional benefit of getting a soil test is that it provides helpful information on how to manage other plants in your yard. Often people spread the fertilizer over the grass around the tree, but the result is better grass and weeds rather than improved tree growth. Getting fertilizer below the grass to the roots of trees is important and not difficult. Many licensed tree care companies offer this service, but it can also be done on your own – follow the steps below. Test your soil before fertilizing to determine what nutrients are needed, how much to apply and when. Fertilizer stakes: Push fertilizer stakes into the ground below the roots of the grass. You will need gloves and a mallet to hammer the stakes about 10 inches into the ground. Granular fertilizer: Dig or drill 10-inch deep holes into the soil. Anything that can be used to plant flower bulbs will work well to dig the holes. Some home and garden stores rent or sell small augers. Place the granular fertilizer into the holes. Liquid fertilizer: Inject liquid fertilizer 8-10 inches below the surface into the soil with a probe. This is the preferred method of the pros, but unrealistic for most homeowners without the special tools. Based on the results of the soil test, head to your local home improvement store to buy the fertilizer. Tree fertilizer is not the same as fertilizer for grass. Look for “Deciduous Tree” or “Evergreen” and water insoluble nitrogen (WIN) on the label. Use a slow-release fertilizer to protect the quality of water in our watersheds. Always follow the directions on the label of the fertilizer. Follow the directions from the results of your soil test. In March or April to encourage tip and leaf growth. 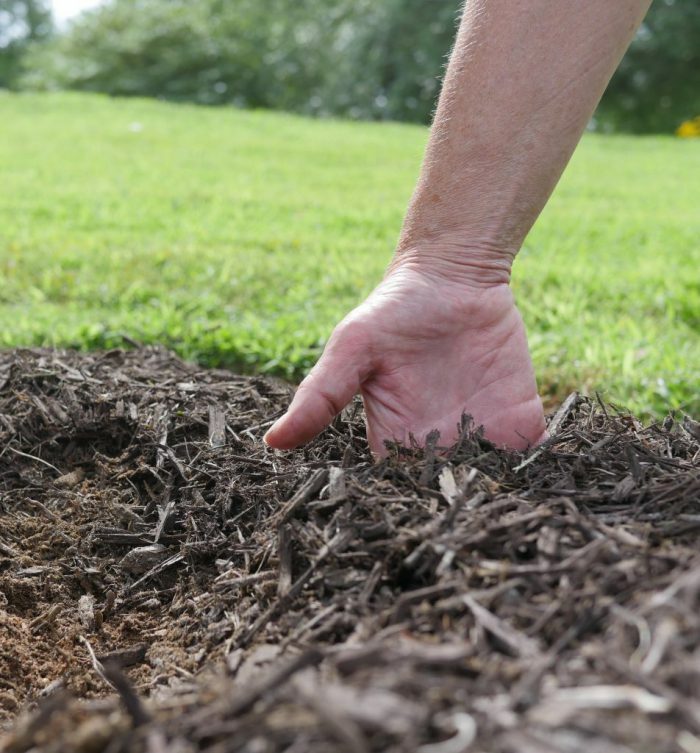 Never fertilize a newly planted tree – mulch is best for the first 3-4 years after planting. 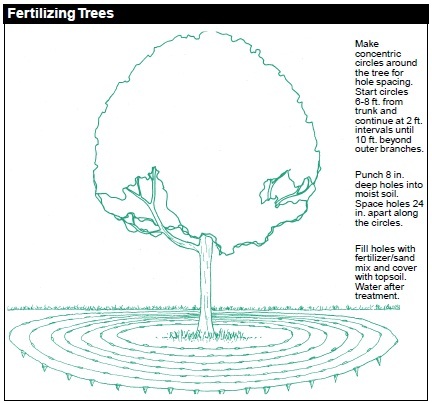 Put fertilizer stakes or dig the holes for granular fertilizer under the branches of the tree in a grid formation, about every 2 ft.
Start at the outside, or the ends of the branches, and go in towards the stem of the tree. For all trees, stay at least 4 feet away from the trunk of the tree and work out to the tips of the branches.